A bursa is a fluid-filled sac located over certain tissues, or joints to prevent excessive friction of the tendon against the bone. The Trochanteric bursa is located along the lateral thigh between the Greater Trochanter and the IT Band and is most often inflamed. Symptoms often include tenderness along the lateral thigh making it difficult to lie on the affected side. 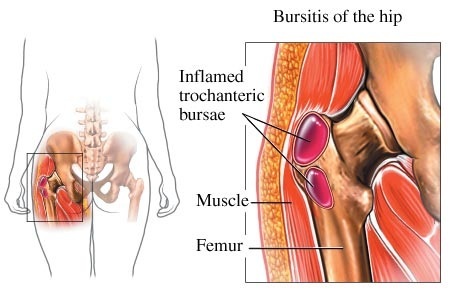 The Ischial bursa is located in the buttocks and often is inflamed with prolonged sitting and stair climbing.